I thought I would actually try to do the Mojo Monday challenge as soon as I got it today. I am supposed to be sleeping right not because I work the night shift at 7:30pm, but I slept until 11am, so I will just take a little nap before work and play with my stamps until then, lol! This is the first time this stamp set has seen ink and I have had it for over 2 months! For shame, I know! It was fun to put this together, it just kept evolving as I went along. 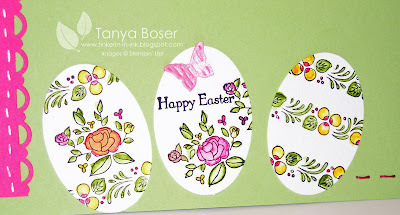 I also used a color combo challenge from Stampin Addicts called SACC47 Forest Friends Easter Greetings. Check them out, there are lots of great challenges there! 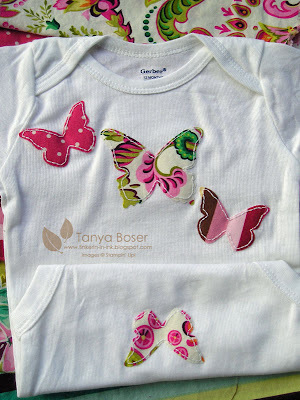 You probably can't tell in this picture, but there is Shimmer Paint on the MOM and on the Pink Lattice pieces and on the butterflies and I inked up the texture plate with So Saffron before I ran the paper through the Big Shot. 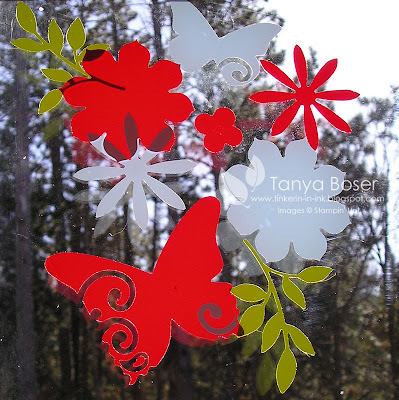 I did some window vinyl ornaments and snow flakes around Christmas, and thought it was time to do something springy. So here are some butterflies and flowers! These were all made with various Big Shot dies and Sizzlets, were cut with different dies on 1 piece. I'm thinking these would look fine layered, if it was on something other than a window. Right now the sun shining through makes stuff on the bottom layer visible. I put these in the upper corner of the door to our 2nd story deck and in the background you see the Norway Pines that give us what little green we have this time of year, lol. Our Decor Elements Vinyl Sheets are available in 22 colors, including Clear, Kraft, and Chalkboard and they include the transfer sheets. Some come in a tube with 2 sheets of 14-1/4"x24" vinyl and 2 sheets of transfer paper for 14.95. The rest of the colors come in 12"x24", 2 sheets vinyl and 2 sheets of transfer paper. The possibilities are endless! I have even drawn an image on the paper backing of the vinyl and hand cut the image. If you are interested in purchasing some for yourself, please visit my demo site (click on the SHOP NOW icon in the upper right corner of my blog and then in the upper right of my demo page). One of our friend's dog died on Friday and I know how much we miss our pets. They are a part of the family and it's hard to lose someone so suddenly. So this card is for Maria and Richie. I used Mojo Monday sketch 130 and some retired colors. I'm just feeling the need to use something old that is new again lately, I guess. The weather continues to be unseasonally warm here in Northern Minnesota. I can't believe I have been able to have the windows open and air things out a couple times already! That really influences my choices in colors. It feels like spring so pastels and florals are very much on my mind, lol! I am sure we will get hammered with a blizzard yet sometime soon. But I will enjoy this weather while I can! My deck door is open right now in fact! I think it is about 35 degrees out and the sun is shining bright right now! Positively Balmy! 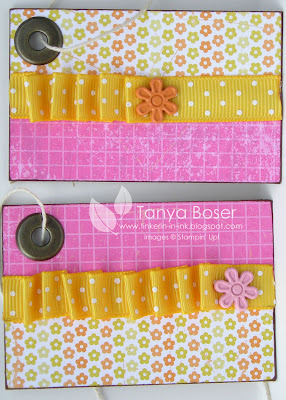 I have been working on making tags for the bags I give my ladies when it is their turn to be hostess for Stamp Club. Well, I finally finished 10 of them. I will bring them to club next time and everyone can pick which one they want and then use the Billboard Alpha die to put their names on them|! These are the first ones I did. All of them are 2"x3".The Paper on these is from the Sale-A-Bration paper pad called Welcome Neighbor. The brad on the left is from the Circle Brad assortment and the the brads on the right are the Filigree brads and Fire circle rhinestones. The ribbon is Bermuda Bay. I used the Jumbo Eyelets in Antique Brass on all of them.The base is made out of chipboard I had laying around-it came from packaging for kits I got from Stampin' Up at convention. I can't throw anything away, right?! Then I made these. 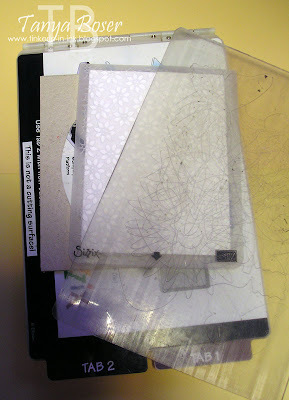 I started using scraps of all the great paper I have laying around. Love this print from Razzleberry Lemonade! Rich Razzleberry and Melon Mambo ribbon added some details. 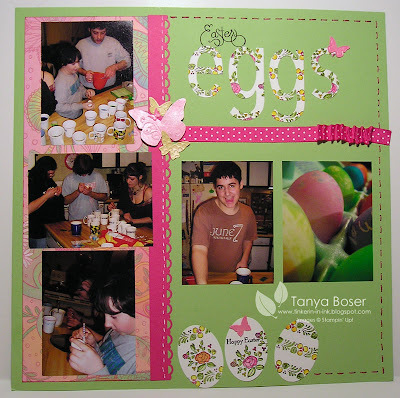 More Razzleberry Lemonade paper, and I used the ruched ribbon (Crushed Curry) method we used on our March Stamp Club page. The flowers are the adorable Flower Brads we carry. They come in an assortment of 4 colors- So Saffron, Pumpkin Pie, Chocolate Chip, and Pretty in Pink. 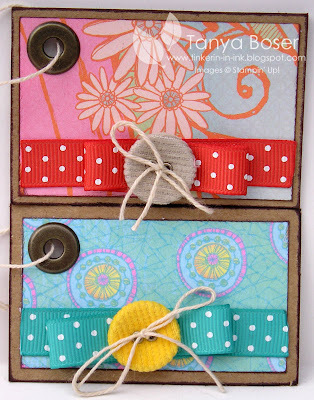 These are made with Kaleidescope DSP, Dusty Durango and Bermuda Bay ribbon, Kraft and Summer Sun corduroy buttons and ecru crochet thread. Again , more Kaleidescope DSP, and Certainly Celery and Bashful Blue grosgrain ribbon with a Bashful Blue button from Sherbet Designer Buttons tied with more crochet thread. More Kaliedescope DSP with Melon Mambo ribbon, Flower Fusion felt flowers, and a Clear Rhinestone Brad. Doesn't this just make you want to go wash your windows?! Or maybe just open then, lol! This is the 3x3 card I did for a swap I participated in. Hopefully I will have my swaps back before this is posted :) This vintage thing is really growing on me, lol! 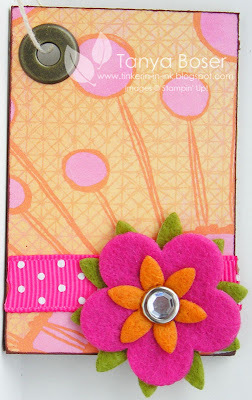 I have had these Flower Fusion felt flowers since early last summer and I am just now starting to use them, go figure. I have got to stop hoarding stuff until it is almost going to retired.... 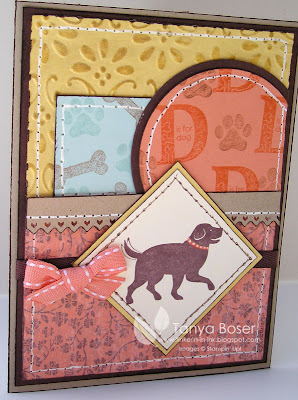 The image and layers are popped up on dimensionals and I punched both layers of the card base along one edge with the scallop trim border punch and stamped the small flower all over the card base in Rich Razzleberry ink. 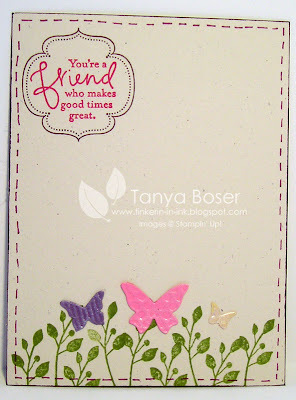 The inside has more little flowers and the phrase from the stamp set in Rich Razzleberry also. I found my inspiration from Michele Tech on her blog here but I of course had to change a few things. I loved the green on the white that looked like a wonderful tin typed ceiling or wall tile. So I had to try it myself. The hardest part was finding an image that would fit in the Curly label punch window that I made that fit in with the vintage feel of the card. I wanted it to stay relatively simple and elegant. I hope I succeeded. I dabbed and rubbed on the embossed card stock with a sponge and Old Olive ink, then with shimmer paint to achieve the distressed/vintage look. This is a different angle trying to show the shimmer, which is gorgeous if I do say so myself! It's hard to photograph though. I also inked up the butterfly with Old Olive, then thumped Chocolate Chip and Dusty Durango on with makers, then added shimmer paint with a sponge dauber. 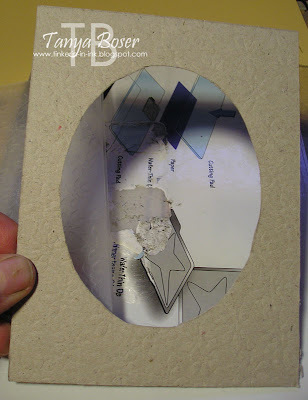 THEN I stamped the image onto the Kraft card stock. And don't you love how the word window, large oval, and tag from Lots of Tags layer together so nicely?! Tell me what you think, leave a comment! My #3 child turned 18 on Sunday. Man I feel old sometimes! I'm not even 40 though, lol! I brought out some retired stuff for this card, cuz it coordinates with the only DSP that works for big boys, lol! I remember when I first got Circle Circus. I couldn't stop using it. Now it sits there forgotten. 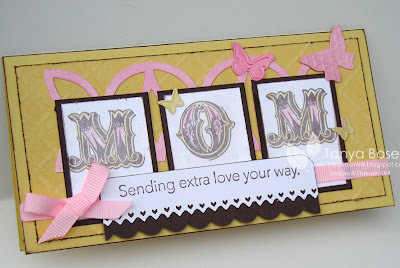 Until this weekend when I needed to make a card for Dakota. I used a Mojo Monday sketch for the layout and I think it still needs something, but I was making this while the cake baked, so I couldn't mess around too much, lol! And this is the birthday boy! 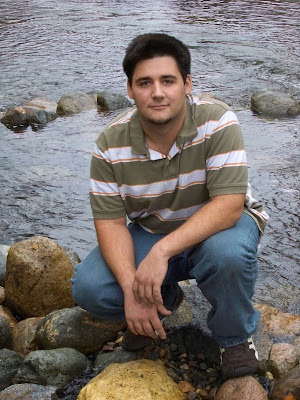 My daughter, Charlene, took his senior pictures. She is going to college for photography, and she is good. No bias here! And this is one handsome boy, it I do say so myself :) we call him Sasquatch cuz he has big feet (size 15!) and is furry, lol! And he has great big bear paw hands. We love our boy, can you tell?! I am just going to post pictures of our projects from tonight real quick because I need to go to work in the morning! I will post directions later this coming week. ETA: I have added instructions in this post. Here is a close up of the letters. I just love how they turned out! 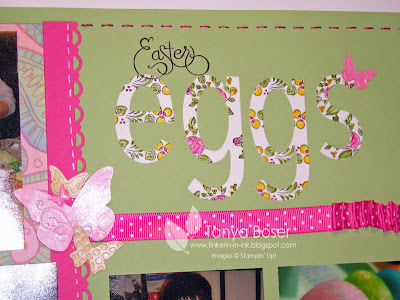 After cutting out the eggs (wide oval punch) and the letters from watercolor paper, I stamped then with line images with Stazon ink. It is permanent on any surface, so it will not run when you watercolor on it :). I then used markers to add a little bit of color to the images, then watercolored them with an Aquapainter. 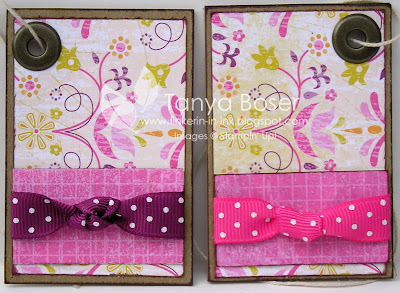 The ribbon effect is achieved by applying SNAIL to the back of the ribbon, then fold/pinch the ribbon as you stick it down to the paper. Easy peasy! You will notice that the butterflies are also shimmery. 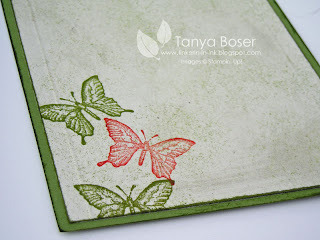 I applied Frost White Shimmer Paint to the paper before running through the Big Shot with the Beautiful Wings embosslit. And a close up of the eggs. This is the card that we made. 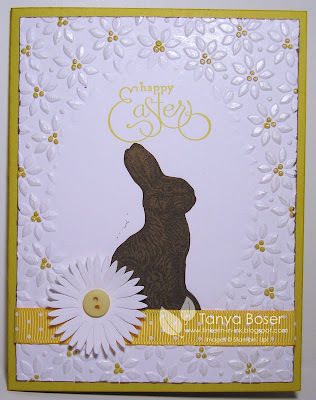 I totally copied this from Lisa Reber, But I did add Frost White Shimmer paint to the embossed part, which really steps it up a notch! And a close up of the details of the card. I colored the flower centers before applying the Shimmer Paint with a sponge so everything is shimmery. The bunny is stamped in Soft Suede on Soft Suede and then cut out. 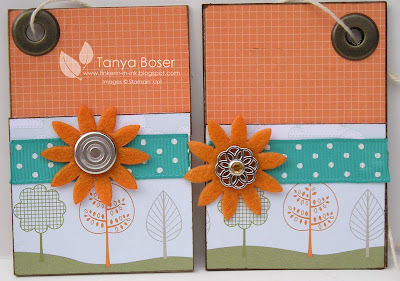 The Daisy and button are held on with a glue dot in the center. 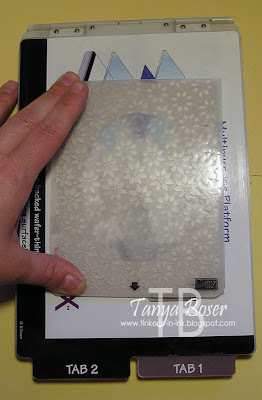 You will put this frame under the embossing folder, not inside when you run it through the Big Shot. 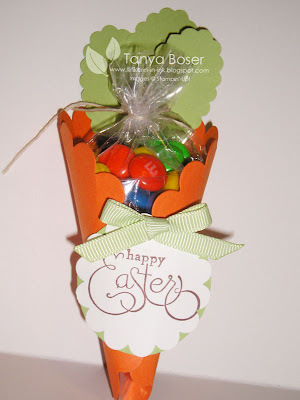 And last but not least, an Easter candy carrot! So darn cute! And I got this idea from MIshelle H who got it from Becky Roberts. Sorry, no link! To make the carrot cone, curl the edges in and staple it. 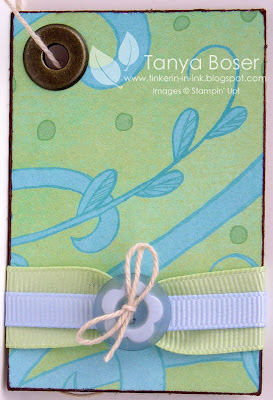 Take 3 scallop oval punches and staple them to the back top. 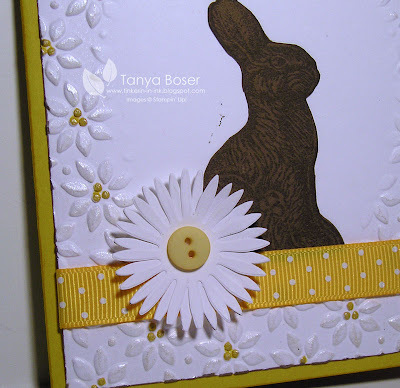 Attach the ribbon bow to the sentiment piece with a glue dot, then use a couple glue dots to attach to the carrot. To make the carrot shaped bag, take a small cellophane bag, fold bottom right corner up to left side of bag, then use SNAIL to adhere it this way. Super easy!